through to my inspiration sources. The Fall 2016 One Room Challenge began this week. I’m going in again! With such great results, I immediately set to planning my next ORC room - the upstairs guest room. I’ve been collecting ideas along the way, and now it is go time. Let me tell you about my space. The guest room is a nice size and was updated when my son left for college back in 2008. Freshly painted Jekyll Island yellow, it worked well as a combo upstairs office and guest room. 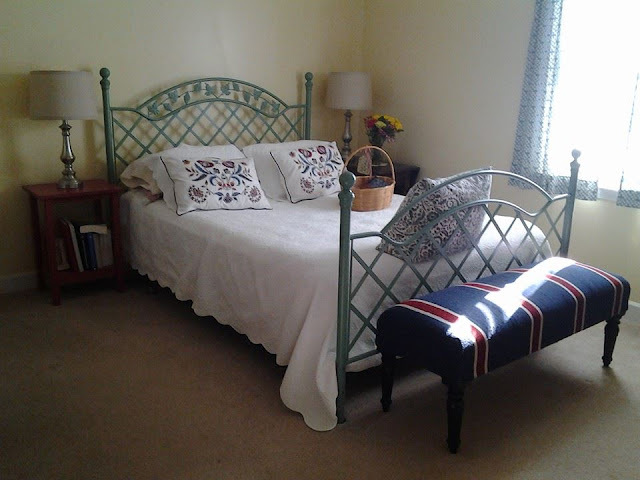 The verdigris iron bed was my grandmother’s, and the ivy green and yellow walls made a sunny and pretty room. Times change, though! Now that I need a staged room for shooting photos of my handmade linens, the yellow walls and green bed make me crazy! With just one window in the room, the lighting doesn’t work and the whole room glows yellow, in all the wrong places. The Changing Room - A guest room furnished with solid basics ready for full accessory and bedding changes as needed for product staging. Three color schemes are planned. Gray / Butter Yellow, Navy / White, Blush Pink / Gray. * Spray paint the iron bed. * Carved wood panels above the bed. * Bed linens. A combination of using what I already have, purchasing some beauties I’ve spotted through my clients when creating for them, and sewing a custom monogrammed duvet cover (because I’ve turned down so many requests that I’ve decided it is time to get on with making this happen). * Curtains / Window Treatments. I’ve been hoarding yards of beautiful, butter yellow jacquard for two years in anticipation of making full length curtains. Swap outs will be some sort of valance for the other color schemes and maybe a cornice board if I can swing it. Window blinds. * Lamps. A couple of sets to swap out as needed. * Slip covers for thrifted chair. * Accessories, throw pillows, and blankets. That’s the plan! I’ve done it once with loads of help from my assistant, Lillian, and I am hoping we can pull it off a second time. Please come around on Thursdays to see my progress, and plan to take some time out over the next few weeks to visit the One Room Challenge site and see the progress of the sponsored participants and the linked-in participants (like me!) who are doing their best to beautify the world one room at a time! UPDATE - 10/07/2016: Goodness! I fell off the 12 Weeks of Custom Christmas wagon just two weeks in. Though I was very prepared with my list of 12 items to show off over 12 weeks, the actual preparing and processing of the post with photos and fresh samples was a little more than I could swing along with regular shop production. I’m thinking I should have planned a 12 Months til Christmas presentation! As well, we had quite a bit of excitement around here in August as our daughter became engaged over the summer, and the flurry of wedding planning started immediately. The wedding dress is checked off the list! It’s difficult to maintain so many trains of thought and creative production at the same time ..... always a learning curve. 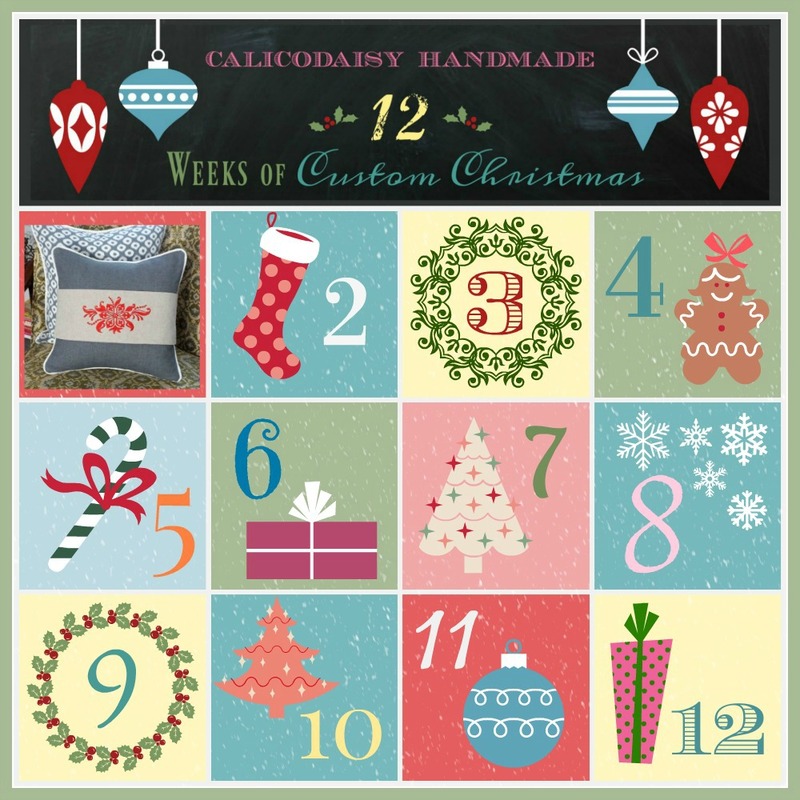 The 12 Weeks of Custom calicodaisy handmade Christmas enters Week 2. 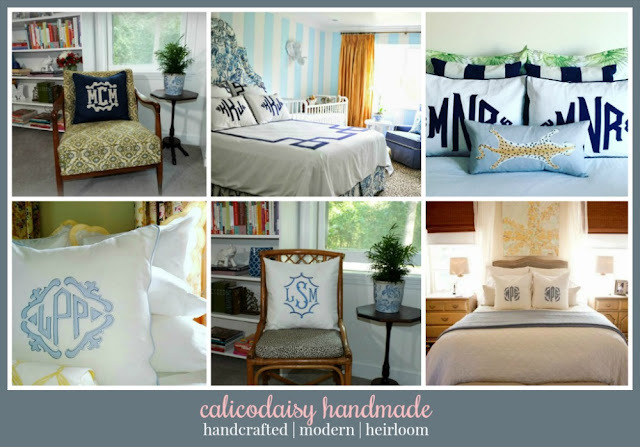 As calicodaisy handmade has a cutoff date of 10/23/2016 this year for custom holiday orders, we are featuring beautiful items each week to pique your interest and entice you to order early! Check back here on Mondays to keep up with the weekly postings of trendy and traditional features now through the end of October. Each week special pricing will be listed for the featured items. 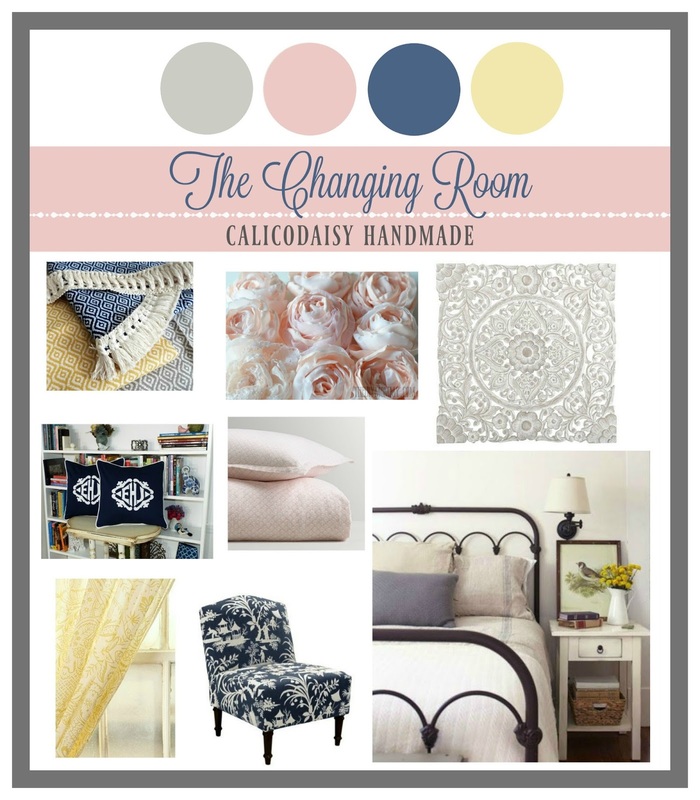 This week’s feature is the calicodaisy gem. The calicodaisy gem is a simply sweet accent pillow cover embellished with an embroidered monogram or initial in your favorite style. The gems are offered in both 14” square and 12” x 16” lumbar sizes and both are priced at $28.00. You can choose any color fabric you like for the cover - in general, and I’ll then coordinate with your color instructions. Now that there are thousands of embroidered fonts available, it is hard to show off all the hundreds I have in my library. On the CDH Embroidery Fonts page, I’m gradually adding samples of the fonts requested most. 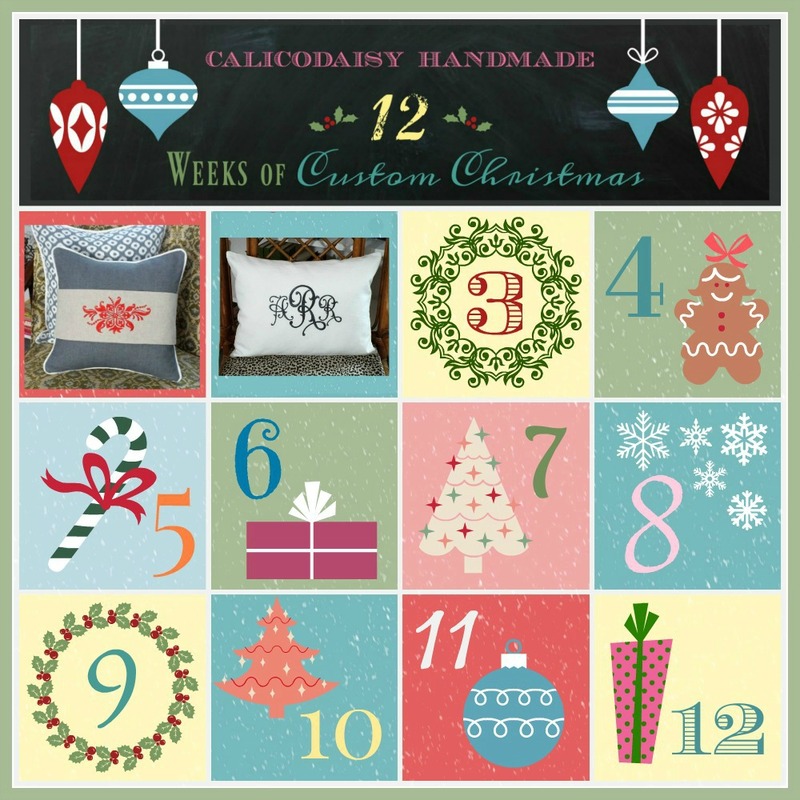 Any of these embroidered fonts are available for embroidery on the calicodaisy gems. If you don’t see the one you would like, you are welcome to request a specific font, and I’ll do my best to find it or digitize it myself. 2. Bundle Special: Four pillow covers for $100.00. 3. Gift Certificates at discounted pricing are at The Building Fund. When you choose the amount you would like, you’ll be taken to a PayPal invoice page. Please come back again next Monday to see the Week 3 feature. The 12 Weeks of Custom calicodaisy handmade Christmas begins! As calicodaisy handmade has a cutoff date of 10/23/2016 this year for custom holiday orders, we are featuring beautiful items each week to pique your interest and entice you to order early! 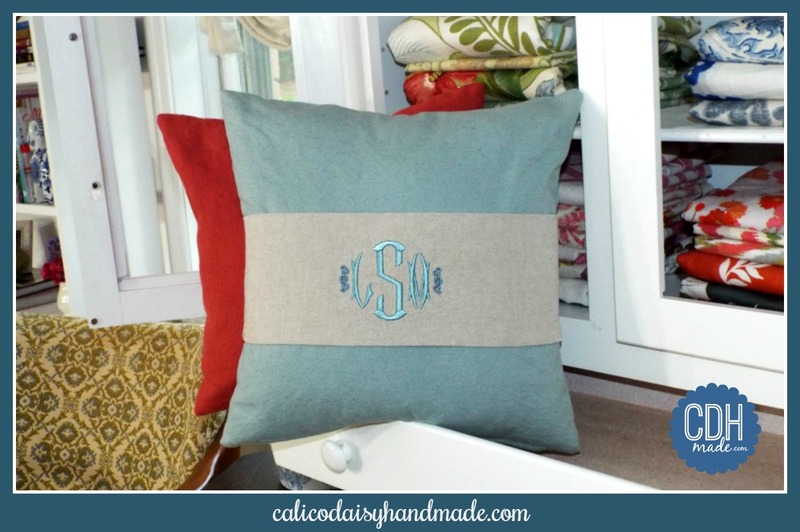 Featured this week are the new Custom Pillow Wraps. A marvelous and versatile twist on freshening up your decor without adding new items to the room. 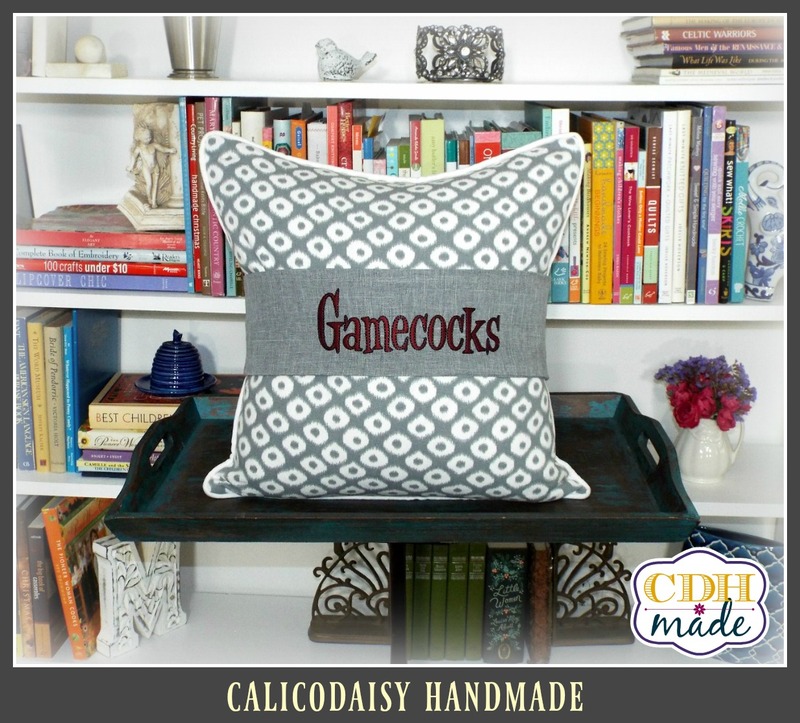 Read all the details that makes CDH Custom Pillow Wraps lovely little pieces of jewelry to finish off your design strategy or freshen up with new fabrics. 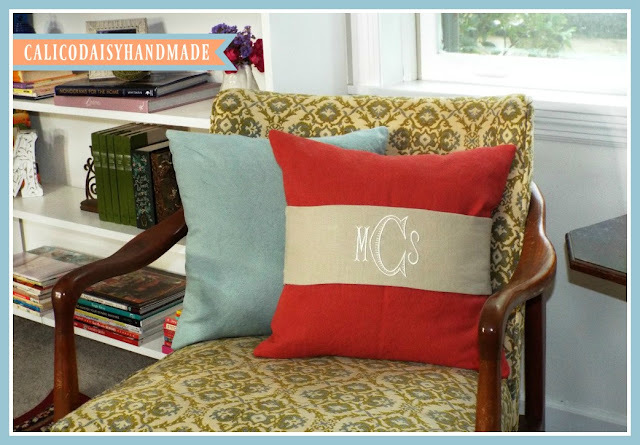 Just like our custom pillow covers, the pillow wraps can be created in nearly any color set. 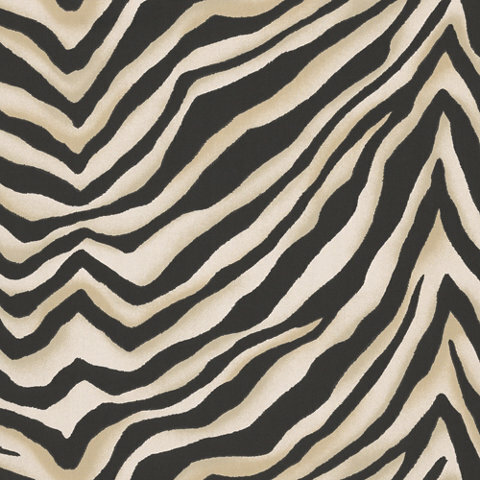 Tell us your shade of color - in general, and we will do our best to coordinate with your look. Seasonal decorating with pillow wraps makes holiday decor so much easier. Rather than swapping everything out with holiday pillows for the season and then having to put them all away, give your everyday look a seasonal update with a pretty pillow wrap. The wraps are reversible and a continuous band around the pillow. No velcro to catch fuzzy threads and grab at your upholstery, no snaps or buttons to fiddle with. The embroidered side of the band can be shown off, and, if the pillow gets tossed around and falls to its other side, no worries, the band is as pretty on the flip side as the embroidered side. Love color block? Turn the band inside out and go for a solid band around the middle for an updated look. See what a pretty change up the wraps make when added to a monogrammed pillow cover. These wraps were sized to cover the original embroidered design. January through October, let your letters shine. In November, display Fall Harvest and Thanksgiving colors. Put the turkey away and switch out the band to a lovely Poinsettia design, and you are ready for the Holidays. Versatile and convenient! Introductory Pricing on Custom Pillow Bands are already listed in the calicodaisy shop. A Holiday Bundle - Set of Two - The “Give Thanks” and Poinsettia Spray designs together at special pricing. Gift Certificates at discounted pricing over at The Building Fund. The posting still features “Christmas in July,” but let’s agree that it really says “Christmas in July until the end of August.” The GCs are actually sold from TBF page. When you choose the amount you would like, you’ll be taken to a PayPal invoice page. Please come back next week to see what we have in store for you and your gift giving shopping list! Your living room is decorated just as you want it. The custom pillows are placed just so. It all looks gorgeous and not another thing is needed …. until the holidays roll around or you have a big Game Day party coming up. 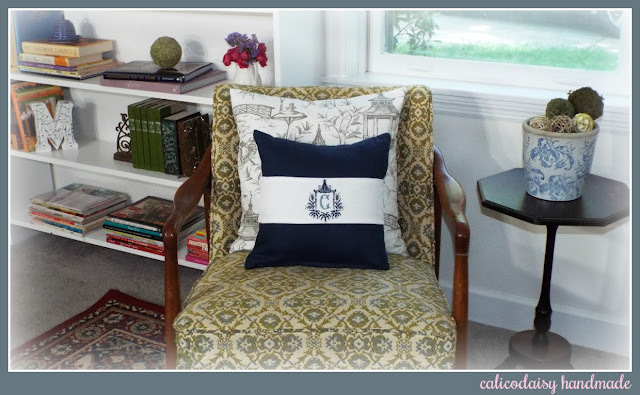 You want to dress things up for the season BUT the swapping out of pillows and putting away again can be so tedious. I have a great solution. Pillow Wraps! Have you seen these before? I spotted decorative pillow wraps at a market a while ago and put them on my list to design a calicodaisy handmade line. This summer, I put in the time in and designed a pillow wrap I would love to have and embroidered out a number of personalized and seasonal options to get started showing them off. First and foremost, the wrap itself is a beautiful small piece of handmade art. Think of it as jewelry for your existing pillows. The wrap is tailored to fit a pillow and not slip, reversible so any side can be front and center, and is a continuous band with no messy velcro to grab at your furniture upholstery and gather threads and no snaps or buttons that kids or pets can fiddle with. Reversible and pretty all the way around. The band looks great with the embroidered design showing and equally lovely turned this way or that, inside or out, offering a color-block option when you want to keep things simple. Customizable. Just as for my custom pillow covers, you can choose nearly any color set you like for your pillow wrap - in general, as I like to say. Show me the color you would like and I’ll do my best to coordinate. Petite piping would be very sweet added around the edge of the wrap. Washable. Always a good feature. 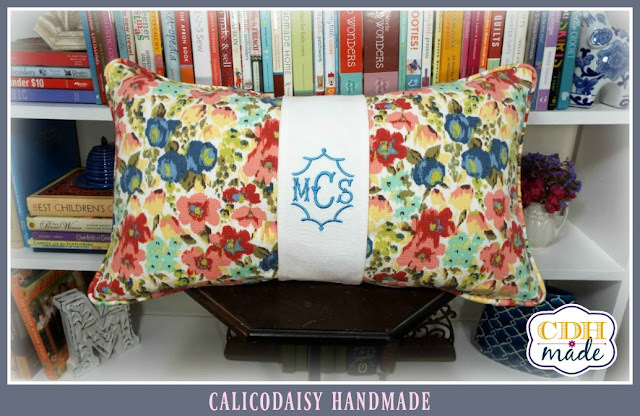 The first set of pillow bands are listed in the calicodaisy shop. I can’t wait to see where client requests and suggestions lead for this new line. 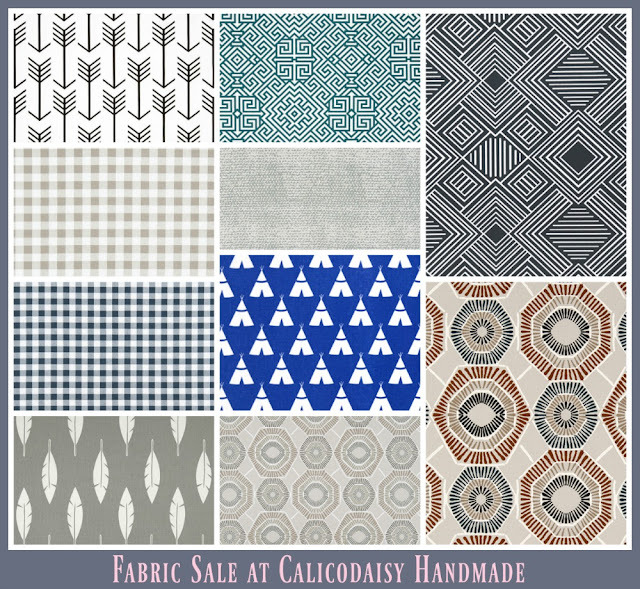 calicodaisy handmade is working toward purchasing an industrial-sized machine. I do long for bigger hoops and more power to create larger and more detailed beautiful designs. When the big one arrives, the plan is to take in ready-made items, handle duvet covers and upholstery, and move through the work at a faster pace. To shore up "The Building Fund," a 20%-off CDH gift certificate sale is on this weekend. 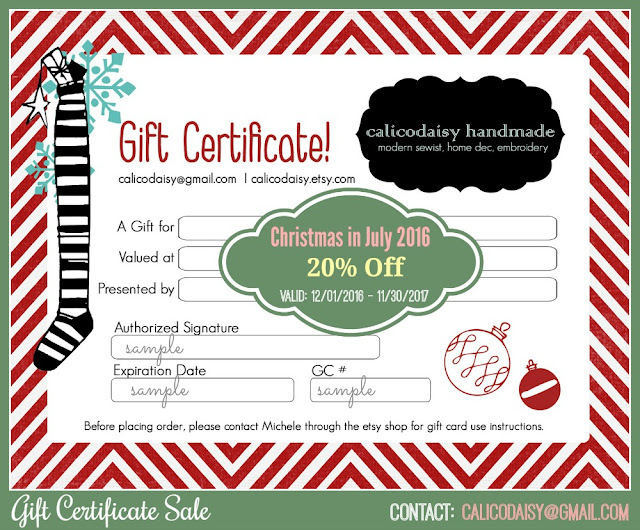 CHRISTMAS IN JULY 2016: Take care of a good portion of your holiday gift list purchasing CDH gift certificates now. At a 20% discount, you’ll be giving your favorite people a lovely gift, the perfect details to be decided on individually. The certificates will be sent to you or your recipient as a PDF by e-mail with all the pertinent information included. If you choose to receive the gift certificate at your e-mail address, the gift certificate will be mailed upon purchase. If you choose the option of sending the gift certificate to your recipient, the gift certificate will be sent out to the recipient on 12/01/2016. See all the details and the "Buy Now" button on The Building Fund page. Please stop by calicodaisy handmade and take a look at all the lovely yardage up for sale. 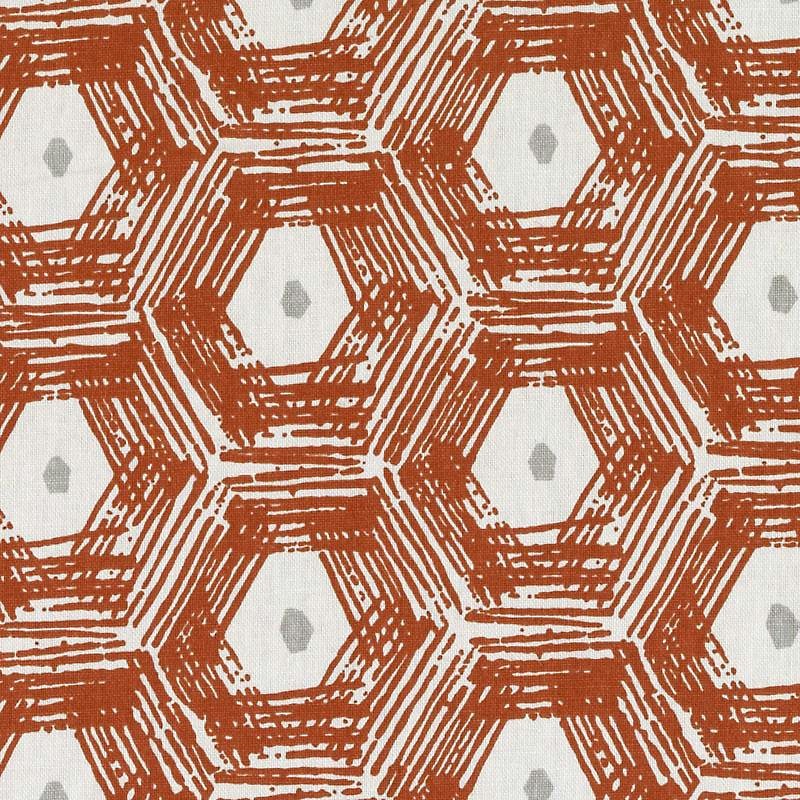 A number of new and standard Premier Prints - Zoey, Arrows, Tribal, Swiss Cross - are listed as well as some great interior designer finds I've made recently. 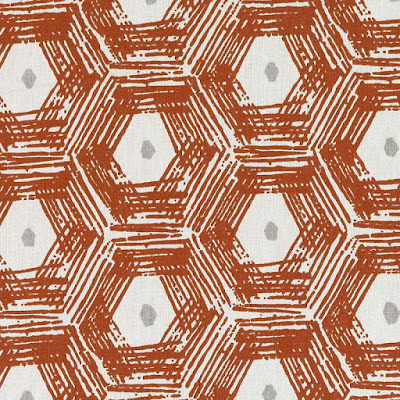 Especially great finds are the Ralph Lauren Cape Mountain Zebra print in the Panther colorway, a fun abstract "Hexasketch" by Duralee in Coral, and, the prettiest find, is a Maine Cottage Sea Biscuit Porch piece that I'm in love with. 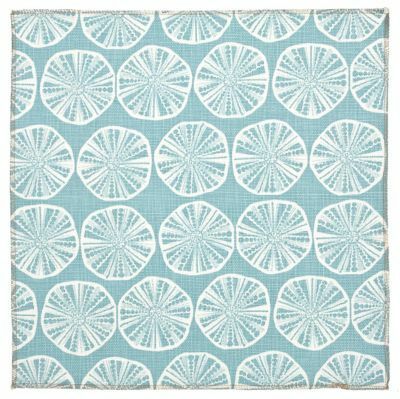 The Sea Biscuit Porch is the prettiest shade of coastal / spa blue. I haven’t mentioned yet that calicodaisy transitioned into a full-time studio in February! 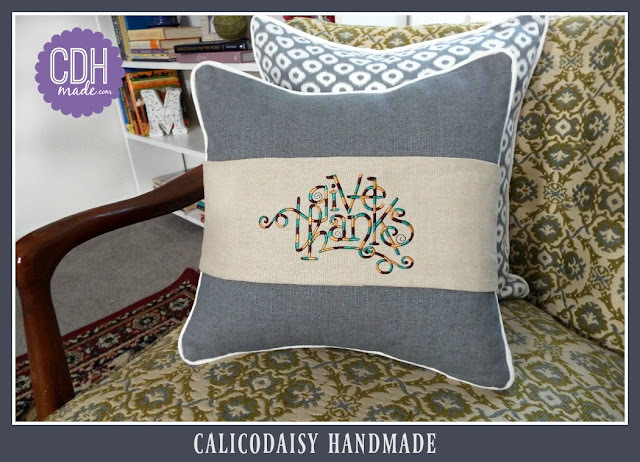 My lovely transcription career finally came to a close, and the plan of calicodaisy handmade becoming my #1 focus became a reality. Now that I’m settling into this big change, the next goal to fulfill is purchasing an industrial embroidery machine and new software. Larger hoops, larger monograms, more intricate designs, and full-time production require hardier machinery that will also speed up the process. In an effort to raise capital quickly but not overwhelm the production calendar with too many orders at one time and to stay as fiscally responsible as possible, the CDH Gift Certificate Capital Campaign is launched! June 1st has long been my go-date as we are six months out from the holidays, and there is a nicely discounted Holiday 2016 gift certificate edition with a shop date of 12/01/2016. The CDH gift certificates are offered at discounted rates based on future order dates. This will keep upcoming GC orders staggered out nicely and offers you the opportunity for a greater discount in exchange for your wait time. This cushion of time built in between your gift certificate purchase now and the future date of the actual order date allows me the opportunity to fund my plans now and have time to learn the new equipment and software all while moving along with current productivity and keeping up with increased sales. For the full story, please click The Building Fund tab at the top of the blog. You’ll find all the details there along with a number of options to fit your needs. If you are a fan of giving GCs as gifts to coworkers and friends, the Holiday 2016 edition at 25% off with a shop date of 12/01/2016 will be a great option. This is an exciting time for me and I’m so anxious to get hold of a machine with the largest of hoops and speedier production time. Your participation in the CDH GC sale is an investment in me, and I very much appreciate your support and confidence in my work.